Clementine is a third grader who doesn't understand why adults are always accusing her of not Paying Attention. She's paying attention, butjust maybe not to the things the adults want her to pay attention. And while she has a series of accidents (like cutting her friend Margaret's hair or coloring her own hair with indelible ink), she also has some pretty good ideas about pigeons. A delightful wonderful little book, admittedly for a younger age group than I normally read. But when you need a break from the doom and gloom of YA, it's time to crack open this book. 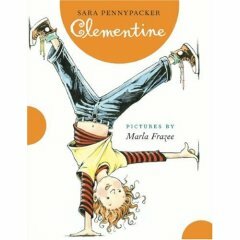 And while parents, babysitters, and teachers may cringe a bit through some of Clementine's adventures, this is a funny read. Highly recommended.